What happens if you mix Texas with Hawaii ? You’d probably get a remote island paradise that looks a lot like Guam: an island with a rich culture, a contentious and diverse colonial history and absolutely stunning vistas. In many ways, Guam seems like a wonderfully unique contradiction. It’s a remote island and an international melting pot; it’s an American territory, and the gateway to Asia; it’s home to an intensely local culture, but it’s filled with outsiders. And to top it all off, it’s just beautiful. 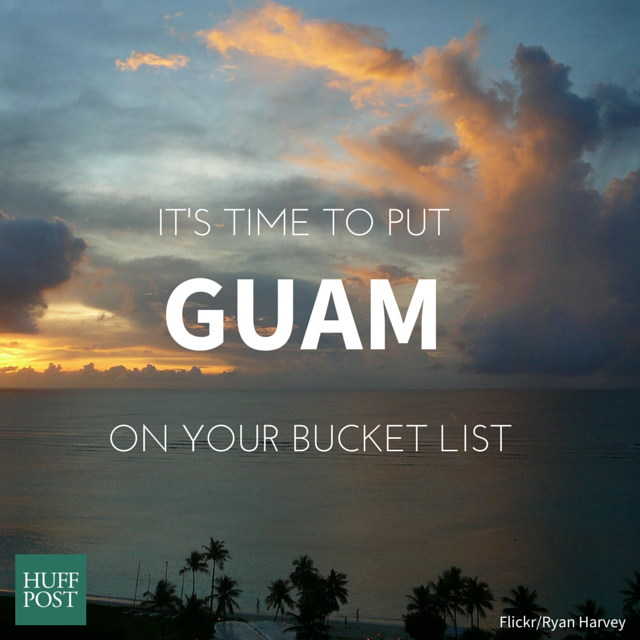 Below, the 11 reasons Guam just might be America’s most interesting and exotic destination. The water is crystal clear and, unlike much of the world, Guam’s coral reefs are actually thriving. Piti Bomb Hole features such lushly perfect coral craters that it looks like they were sculpted by bombs. Between Apra Harbor, where WWI and WWII ships sunk on top of each other, to Gun Beach, where stingrays go for breakfast, divers and snorkelers are never, ever bored. With clear influences from Spanish and Mexican cuisine, Chamorro food features tortillas, tamales, atole and chilaquiles. Locals especially crave Finadene (a soy sauce-based condiment) and Chicken Kelaguen, which features lemon, chile peppers and coconut shavings. The U.S. territory enjoys the culture of the Chamorro people (the indigenous Pacific islanders), but with heavy Spanish, Japanese, and American influences. It was first colonized by Spain in the seventeenth century, was occupied by Japan for two years during World War II, and is home today to a relatively large U.S. military presence. Are you ready for this? Many equate the culture in Guam to that of Texas. Seriously. Between an obsession with high-school football and little league to the people themselves, apparently the Lone-Star state and the lone island have a lot in common. Guam locals have big hearts and even bigger parties (called village fiestas), and a frontier mentality means that communities are tight-knit and take care of one another. To get you drooling, just try Instagram searching the following: Pagat Caves, Cetti Bay, Sigua Falls, Ague Cove, Talofofo Falls and Marbo Cave. Yes, please! This is the kind of majesty you have to see for yourself. Agana Bay and Alupai Island at sunset. Reggae and ukelele lovers rejoice. With such a laid-back lifestyle, it’s easy to stumble upon great live music at the beach, the bars or the ubiquitous barbecues. Admit it: vacationing in Hawaii is so last century (ahem, “Mad Men”). Guam, on the other hand, is the new exotic destination for America. Guam is “where America’s Day begins” — quite literally. With it’s own timezone (Chamorro Standard Time), Guam wakes up 14 or 15 hours ahead of the Eastern Time Zone, depending on Daylight Saving Time. The island celebrates New Year’s first in America and movies often premiere ahead of the rest of America. Perhaps the island’s most famous landmark is Two Lovers’ Point, a dramatic and steep cliffside overlooking the Philippine Sea. According to Chamorro legend, two star-crossed lovers, forbidden from being together in life, leaped from the cliff so that they could be together in the afterlife. Not surprisingly, weddings are held there regularly.